eCommerce is getting stronger by the day. Innovation is what will sustain existing players and new entrants. eCommerce chatbots is an innovation that has partially automated processes. Three focus points to improve the standards of eCommerce are mobile engagement, improved customer service, and improvised shopping experience. 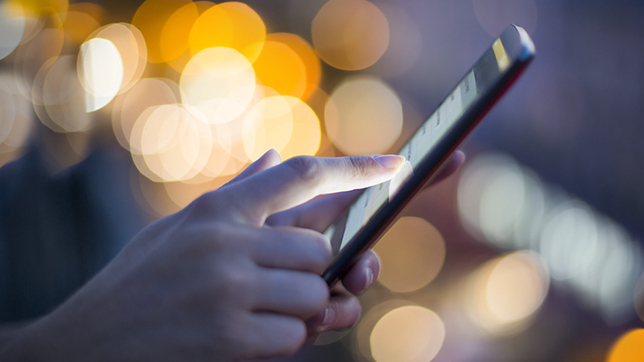 Companies have catered to the need of being easily accessible on mobile. 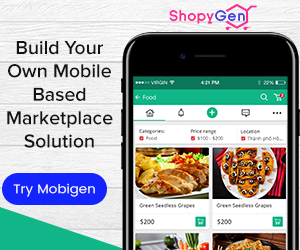 eCommerce businesses are available on mobile applications. Retailers can work on making their websites responsive to cater to the different needs of mobile users. According to Think Tank Gartner, eCommerce-driven mobile revenue will surge by 50% by the end of 2017. Excellent customer service drives repeat sales. If an eCommerce business has excellent website & app, products, and offers, but does not provide an equal standard of customer service, it cannot sustain in the market. Customer loyalty is built by the kind of customer service a brand provides and when steps are taken to improvise it constantly. Here are three ways to personalize the shopping experience on your e-store. Answer questions on social media platforms, user Facebook Live, YouTube video and blog posts. Use email to intimate important updates and newsletters. Experiment and find a strategy that works for your business. Use feedback and reports to constantly improvise. Post authentic content to draw attention to a brand. People follow multiple brands of their choice (who are mostly your competitors) and can spot copied content faster. Easy returns, simplified and faster refunds improve the quality of customer experience. 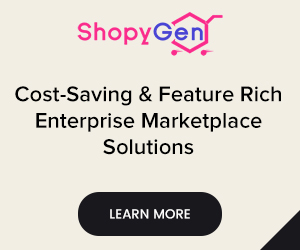 With limitations of no see, touch and try in eCommerce, the above-mentioned services make it easy for the customers to shop. What is Facebook Messenger bot? A bot is a program that uses artificial intelligence (AI) to converse with users through text, voice and rich media. The chatbot is built on Natural Language Processing (NLP). This technology has been in use for ages by banks and mobile phone network provider to take you through the initial process of addressing basic problems and transferring calls to concerned departments. It was done through voice and input commands. With changes in the digital landscape, social media platforms introduced their own bots to improvise relationships between businesses and their customers. Like Apple’s Siri and Amazon’s Echo, Facebook’s messenger is a digital assistant. How Facebook AI Bot Works? You can set predefined answers to your predefined questions. These will be the possible questions that your users may ask relating to your business – inquiry, purchase, returns, customer support etc. There’s no doubt that social media platforms are the best place to be in constant communication with customers and prospective customers. Because people are always on social media, brands can strengthen their social media presence and forge stronger relationships with customers. Facebook has 1,936 million monthly active users and the Facebook messenger has 1.2 billion MAU as of 1st quarter 2017. Obviously, no business would want to lose such audience readily available on a platform. eCommerce bots automate marketing and operations to a certain level. Coupling hands-on with AI, they can take up some of the many burdens in these two departments. Bots can start off asking few questions including options, and/or yes/no questions. This directs to a more specific department or section that can serve the customer better. Bots gather all the information required for further processing so the people working behind the desk can take it up from there. So the first-half of the process is automated and handled instantly. Mr.Chatbot is also utilized for any other duties that can be outsourced to virtual assistants. These are some of the many small, yet significant tasks that Kit can do and save your time. 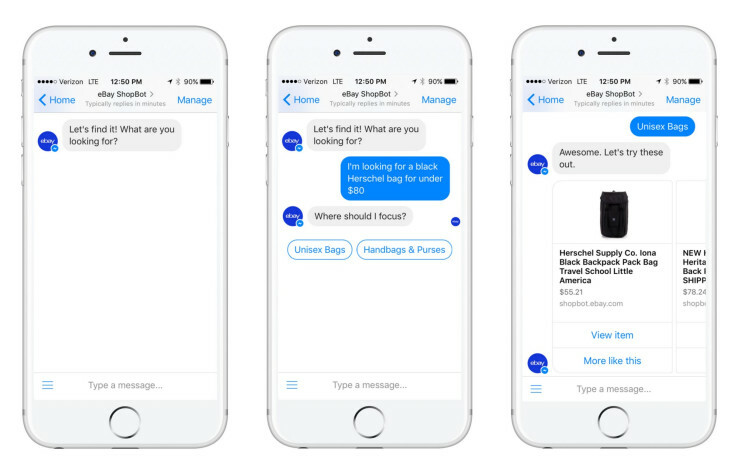 How is Conversational Commerce Changing eCommerce? Meaningful exchange of information between businesses and consumers through chatbots is conversational commerce. Strengthening the bond between brands and its consumers. The most personal form of engagement a customer can have with a business online is not a Like, comment, share on Facebook, an email opt-in or even a purchase. It’s a conversation. And Facebook messenger bot is making it possible. Facebook Messenger bot list shows us the companies that are using the Facebook chatbot. Facebook bots should be designed in a way to make life easier for your customer. So you set up pre-defined questions in a way that your customers get closer to check your products. 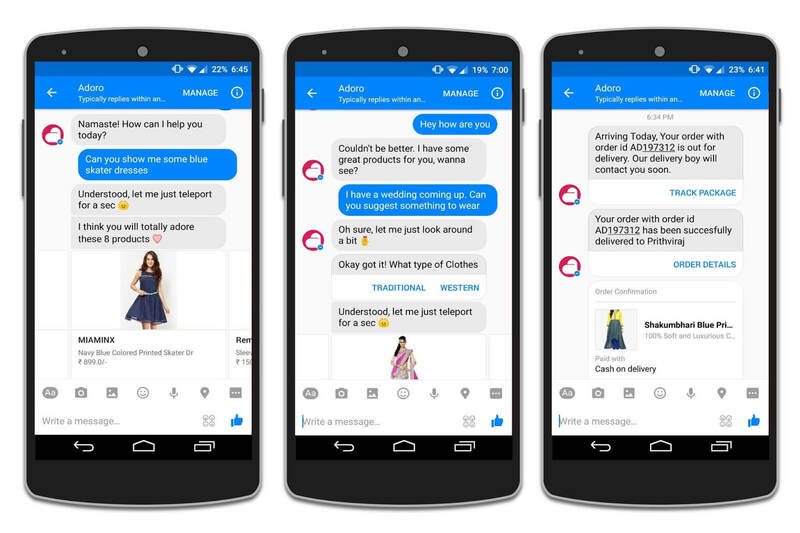 These eCommerce companies have some of the best messenger bots. 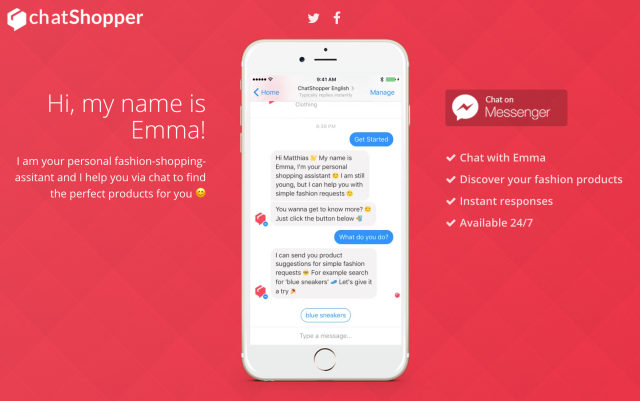 ChatShopper is the first eCommerce fashion and shopping chatbot for Facebook Messenger. It works by asking users about their taste in fashion and replies with product suggestions. 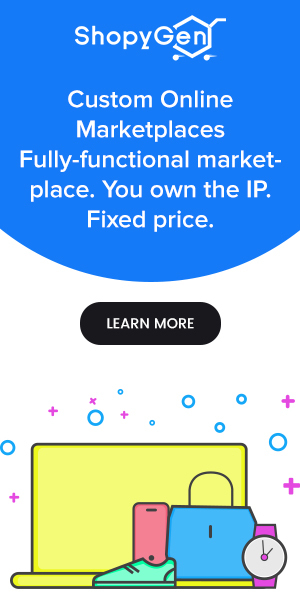 eBay’s Messenger bot, eBay Shopbot is purely practical. 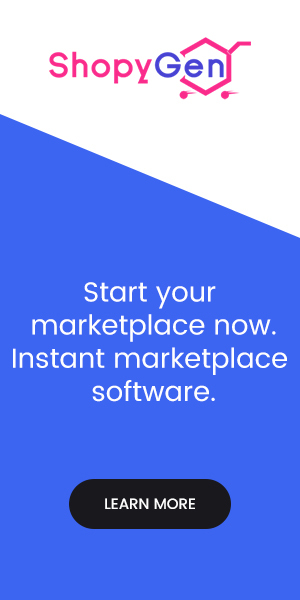 It helps users find and buy items from the site within the Messenger platform. Users can do everything from within the messenger – toggle between suggested items filtered by price to finding popular items. The Shopbot tailors future suggestions based on user’s choice and remembers common searches. 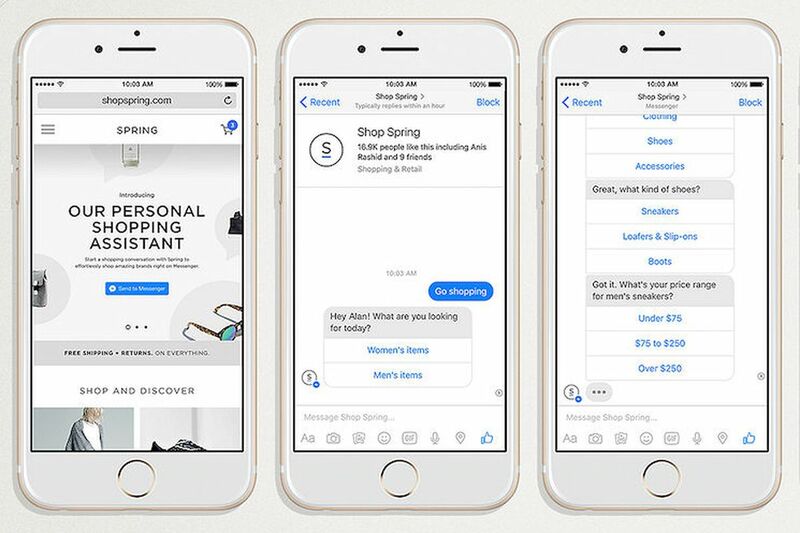 Spring’s shopping bot is designed to list out questions to interact with users. So it is not exactly like a human conversation, but the questions are framed well to guide the user through the process for every choice they make. The bot is very popular since it serves it purpose very well. Create your own Facebook Messenger bot to engage with your audience via automated processes to do the kind of work it does best. Within your pre-defined questions and answers, you can include structured messages, images, hyperlinks and call-to-action buttons. 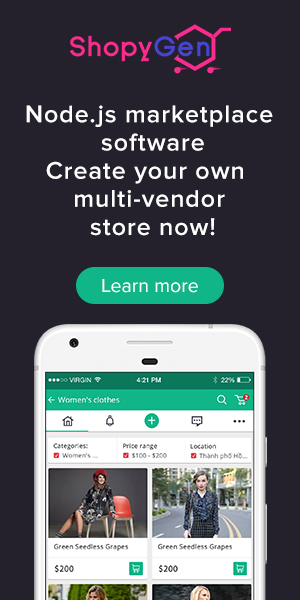 Your user can browse product carousels to discover options and will be directed to your website to make a purchase. The way you design your bot will determine its success. When your users find it friendly and easy to use, they end up purchasing. But if the bot floods them with irrelevant replies, general suggestions instead of personalizing (so they don’t get what they are looking for), or, confuses them, then your bot needs to be worked upon. Chatbots are a valuable channel to engage in a question and answer kind of way. It is a step ahead from the earlier way of searching on the internet, comparing options and researching before buying a product. It is also easier to engage a customer in conversation and convert them to buyers by offering them personalized and immediate service. 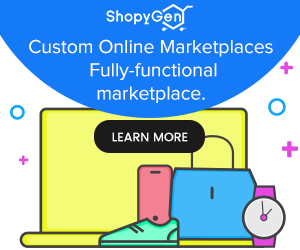 Harness the power of this technology to take your eCommerce business to the next level.